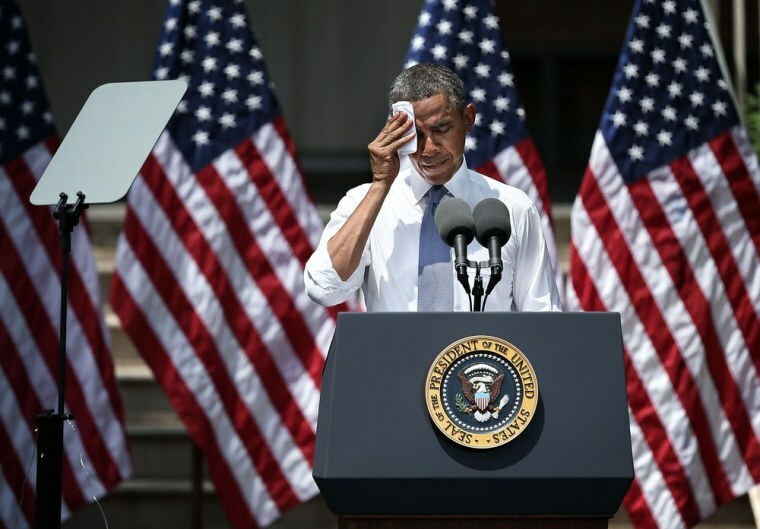 With his jacket off on a sweltering afternoon, President Barack Obama Tuesday unveiled a strategy to slow the effects of climate change so that future generations will have a cleaner and more stable environment, including curbs on pollution from new and existing power plants. "As a President, as a father and as an American, I'm here to say, we need to act," he said to applause at Georgetown University in Washington, D.C., where he unveiled the climate action plan. "I refuse to condemn your generation and future generations to a planet that is beyond fixing." At the heart of the strategy is a commitment to reduce the United States' greenhouse gas emissions by 17 percent from their 2005 levels by the year 2020, a target he first set during the 2009 international climate negotiations in Copenhagen. This will be done through sweeping changes to the way the country uses energy — using less fossil fuels, more clean energy such as wind and solar, and wasting less energy throughout the economy via measures such as more energy efficient buildings and cars that get better gas mileage. He also said that he would approve the controversial Keystone Pipeline to carry tar sands oil from Canada to Gulf Coast refineries only if it is "in our nation's interest. And our national interest will be served only if this project does not significantly exacerbate the problem of carbon pollution." The plan is an important step to confront the threat of global climate change and is largely in line with a strategy outlined earlier this year by the World Resources Institute to hit the 17 percent target, according to Kevin Kennedy, director of the U.S. Climate Initiative at the non-profit organization. "Whether the plan actually achieves the 17 percent, we are not going to know that today," he told NBC News, noting that implementation of the plan will require "a lot of hard work." There is also the question of whether the 17 percent target in and of itself is sufficient to slow the effects of global climate change, which Obama noted in his speech are already being felt via increased storms such as Hurricane Sandy, record-setting heat and disappearing Arctic ice. "It is not by itself adequate, you need to look at deeper reductions to achieve the sort of stabilization that we need," Kennedy said, but called Obama's strategy "an important first step." The sentiment was echoed in a statement released by Alden Meyer, the strategy and policy director for the Union of Concerned Scientists. "Scientific evidence has continued to mount that deeper and faster reductions are necessary to steer clear of levels of warming that the world has committed to avoiding," he said. "Ultimately, we will also need a price on carbon emissions that reflects the rising costs of climate change. Congress will have to step up to the plate." Even coming within striking distance of the 17 percent target may prove difficult if the country hopes to achieve modest economic growth in the range of 2 percent to 3 percent a year, according to Roger Pielke Jr., a science policy expert at the University of Colorado who writes frequently about climate change. "All you need is a little bit of change in the price of natural gas and that curve starts going up again pretty sharply away from that 17 percent reduction," he told NBC News. That's because industry will revert to burning dirtier fossil fuels such as coal, perhaps before implementation of new rules limiting their emissions. "Any war on coal," he added, "will be a long fought battle, politically." What's needed, he said, is an aggressive international strategy to reduce carbon emissions via a shift to more nuclear power, advances in technology to capture and store carbon emissions from power plants, and investment in energy innovation. "The big oversight I see in the plan ... is the almost complete inattention to the need for sustained, large-scale investment in energy innovation," he said. Nevertheless, many members of the environmental and science communities applauded Obama's strategy as a good start to address the challenges of global climate change. "This is the change we have been waiting for on climate," Michael Brune, executive director of the Sierra Club, said in a statement. As Obama wrapped up his speech, he put the challenge of fighting climate change into the context of the Apollo astronauts sending back images of planet Earth. "That image in the photograph, that bright blue ball rising over the moon's surface containing everything we hold dear, the laughter of children, a quiet sunset, all the hopes and dreams and posterity, that's what's at stake. That's what we're fighting for," he said. "And if we remember that, I'm absolutely sure we'll succeed."